Polyurethane seals for high-pressure applications are manufactured at our ultra-modern in-house machine shop are made from world-class materials purchased from globally renowned chemical producers. Our polyurethane seals for high-pressure applications have proven to stand apart from those of other brands in the industry. In most cases, the materials produced by these brands either did not last or are of poor quality. As such, we developed polyurethane seals for high pressure applications that are state-of-the-art and one of the best the industry has to offer. To ensure that our Polyurethane Seals for high-pressure applications are available in wholesale proportions and consistently of topnotch quality like every other urethane product manufactured by us, our team of technicians always apply speed and precision during production. Our innovation and technological expertise add value across a range of industries through the production of high-quality rubber seals for high-pressure applications. Our team of engineers can also customize rubber seals for high-pressure applications to fit your specification or create a direct replacement for your existing machinery. 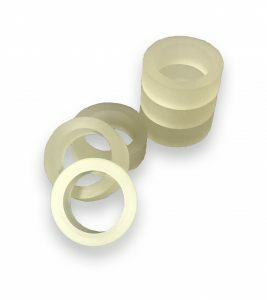 It is, therefore, safe to say that irrespective of the volume you require for your business, our urethane high-pressure seals are very cost competitive and offer the best value you can get for your money. Plan Tech also has an outstanding team of dedicated employees with exceptional talents designing and manufacturing urethane molded parts. We also are very proud of the “company we keep.” Our customers include many Fortune 500 companies, most of whom have been customers for 20+ years. Their drive to become industry leaders has helped us do the same. Whether you are a start-up company or global leader, we can add value to your products with our strong engineering support, urethane polymer experience and constant focus on meeting all delivery requirements. Our rapid prototyping capabilities have also received particularly positive feedback – we frequently go from “Print to Part” in 10-15 business days! Everything we manufacture is MADE IN THE USA! Are you interested in polyurethane seals for high-pressure applications? Please Contact us so we can help solve your requirements and work with you on your specific application!